1. 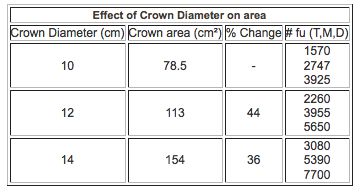 The crown, or top of head, is circular in shape so as Male Pattern Baldness advances, the crown radius increases. The area of the crown hair loss increases quadratically since it is equaled to πr2 as seen in the image below. 2. Part of the crown is vertical so it becomes a billboard; with light hitting it appears thinner and see-through. Flat surfaces like the mid scalp and frontal zones can benefit from the shingling effect, hence less density is necessary. But it is not as simple as just that, because Male Pattern Baldness, “MPB”, can be chronically progressive, one has to leave a safe buffer reserve in case it is in the genes of the hair restoration patient. That is not to say, crown restoration should not be attempted as it can be a viable hair loss treatment. A Crown Hair Transplant can be done safely and effectively in the proper patient as long as proper informed consent is given regarding the above operant factors. In the wrong patient hair islands can be created. These result when the crown is restored and subsequent hair loss creates a zone of alopecia hair loss around the island transplant. Again, hair characteristics play a pivotal role in hair restoration outcomes and should be discussed with your hair restoration professional.